Welcome to my SQLite3 Tutorial! This tutorial is part of my Android Development Tutorial, so my Android tutorial is not over. I have many more videos on Android coming. 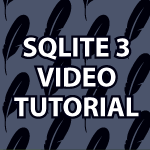 In this video I explain how to install SQLite3 on both Mac and Windows. I also cover how to use SQLite3 using the console. SQLite is an embedded relational database that doesn’t require a dedicated database management system. The database is part of your code and not an outside resource. The reason for creating SQLite was to provide a self contained database that was easy to use, could travel with the program using it and run on any machine with no other required software. i need some of your help. i had given a task in my office, in which i need to write one utility class to create and load some data in our product, i wrote that one class which create huge amount of complex data, i just need to run that class and it creates and loads all the data. now scenario is changed, we may need to load this when our product gets installed, but the problem is during product installation data can be loaded from xml loaders, but i created all data using java classes, and now i don’t want to waste all my efforts, is there any way for this? one way which hit my mind is, if i can call that java class in one xml file, and load data using that xml file, but i am not sure if this would be possible or not. Sorry for deviating from topic. How to stop the concurrent data read from the database. Basically i want to stop the concurrent usage and do not want to use row lock. How to achieve this in my application. Are you thinking to cover anything about performance analysis, front end , back-en, transactions and all.. if not in your list can you add it to your list a request ? Thank you very much for your great tutorials. Can you please create a tutorial on storing/retrieving images in SQLite. You’re very welcome 🙂 I will be covering that topic soon. I’ll store pictures, video, sound, etc. Mr. Banas, is sqlite3 good for an android app that will be using a large dataset? I am building a fitness app and my data will include various exercises along with other “text” info but then i will also be including pictures and videos to along with the exercise. Does sqlite3 good for that? i have been reading sqlite should be used. What is the difference between sqlite3 and sqlite? No if you have a lot of data it is better to use a server side database to pull info from. I’ll be covering how to do that in my new Android video. Thanks for an amazingly clear, concise set of instructional videos. These are my go-to resource to teach myself Android programming. One query is there anyplace a comprehensive Table of Contents or Index for which video covers which topics? I’ve reached the point where I don’t need to understand feature ‘X’ this minute., but a few days later I hit it, and have to bounce through the videos to find out which covered what content. Thank you 🙂 Actually I have exactly what you asked for on this page Android Video Tutorial, but I need to add the last bunch of videos to that page, which I will do tomorrow. I’m glad you are enjoying them and I will be making Android tutorials for quite some time. I am LOVING these tutorials. I pick things up really quickly and you’re one of the fastest video instructors I’ve ever seen, I’m so grateful! I am enjoying not being bored while watching a video tutorial for the first time, in a very long time! I’m watching all these in preparation of building an app that would manage contacts and invoices, etc. I want to be able to store my data on the cloud or on a server, so that I can access is from my nexus phone and my nexus tablet. Is that plausible with SQLite3? Keep it up! I’m sucking it up like a dry sponge in the desert suddenly confronted with a flash flood; and I love it! Thank you 🙂 Yes I may not be the best, but I’m probably the fastest. As per storing large amounts of information you’ll probably want to store that data on a web server. I talk about how to read from a web service. I’ll soon cover how to set a web service up. SQLite is used when you want to store a rather small amount of information, but very often that is all you’ll need. This is where I start to feel the holes in my self taught education. What constitutes a large amount of data vs a small amount? At any given time I have from sixty (if I’m not really working hard) to three or four hundred clients and contacts; Then I have invoices for each, typically between three to seven new records a year; and anywhere from just three, total, to five hundred team members on my sales force (again depending on if I’ve been healthy enough to remember to do my sales calls and team coaching… High turn over, what can you do? Sales is tough) I have sales reports for them, and goal progress and personal notes, and then my product inventory. Personally it feels like a lot of information, which is why I’m trying to find a way to manage it better. However, my husband’s a database engineer, and I know it’s very common for him to work on databases with terabytes and more of data and several million (if not hundred-million) records. (which you would think would answer my questions, but he just shrugs and says he doesn’t know what I should use because he doesn’t work with mobile asps/hardware and/or sqlite.) I won’t be using nearly that much data. I’ll be lucky (making LOTS of sales ;-D) if I can get over 700M. But would that be “large” on a database using sqlite? There would only be two instances running at any given time (tablet and phone) both of which I’d be the one using, and an average individual tends to use one or the other, so I don’t think concurrence and record locking would be an issue (I know you mentioned it doesn’t handle that well, if it’s gonna be hit from several users at once) Or is 500M to 700M or so going to be large for sqlite? If you have over 100 contacts I’d use MySQL and have your web server handle all the calculations and data retrieval. That is just my rule of thumb though. I tend to only use SQLite when I’m working with unimportant data. Hi Derek, do you have an video about how to use Intent sniffer Tool. If if you have any, please share the link. Hi Roland, Sorry, but I haven’t covered that topic yet. I’ll see what I can do. Thank you very much 🙂 Sorry, but I don’t use ORMLite so I doubt I could do a better job then the other tutorial people out there. I love your tutorials they are all really educative in sense that you change lives. I watched your sqlite3 tutorials in order to create an interactive dictionary. The idea is to have three tables. (1) language1, (2) universal language, (3) language2.. It is a dictionary and not a translation tool. I will give a user a choice to selection a language from and a destionation language. What my universal language will do is to facilitate. Each word will have an ID like a social security including (country or language id, word id and may be additional identificatong). The universal language will have a relation with all languages. Do you have tips or suggestions? I would like to hear from you. Thank you very much.